About the work: This piece depicts the Psyche orbiter making its way through the asteroid belt towards its new home, Psyche the asteroid. I started the painting with a watercolor outline of the asteroids and the orbiter. Once the outline was complete, I worked on the background by using different “space” colored gouache and acrylic paints in different areas to suggest that the orbiter is traveling through space. I will usually start with one color, adding it to different areas of the painting before moving on to a new color. This allows for the painting to be balanced with color, forcing your eyes to travel through the painting. Once the background was finished, I worked on laying down color for Psyche and adding details along the way. 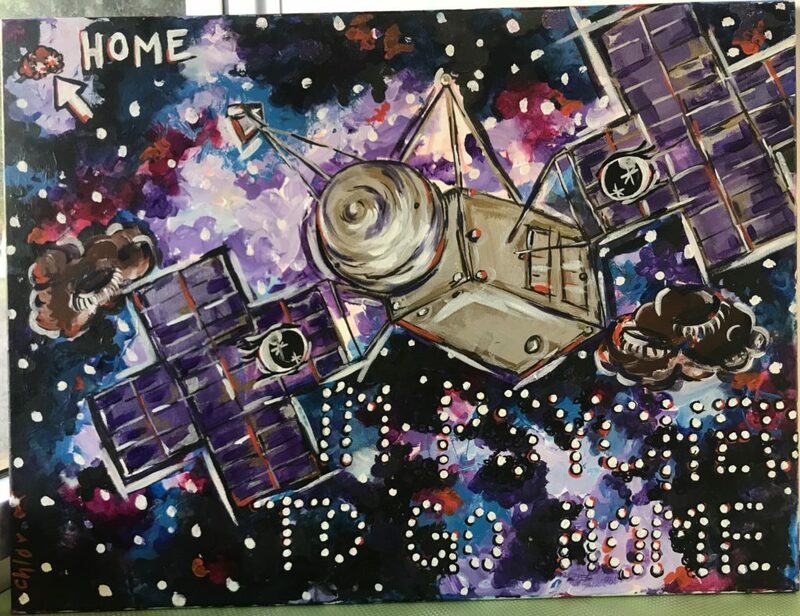 Painting the orbiter on top of the space background gives a 3D effect, while the eyes on the solar panels and the hopeful message in the stars suggest a more human persona for the spacecraft.